The MATLAB® MAT-file Viewer plugin is three plugins at the same time. 1. It adds packer support for the MAT-file type, i.e. you can treat MATLAB MAT-files (Version 4, 5 and 7) like archives. For example, it is possible to view variables of a MAT-file, to compare the variables of two open MAT-files, to delete variables from a MAT-file, or to add real numeric data from a text file to a MAT-file. 2. It can be used as content plugin, too, showing information about MAT-file version, platform (Version 5 and 7 MAT-file only), creation time (Version 5 and 7 MAT-file only) and number of variables. 3. 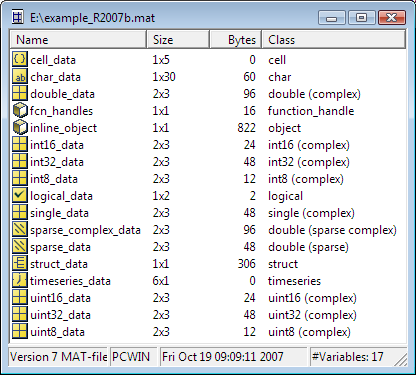 The lister view shows the variables of a MAT-file, their size (number of elements), their size in Bytes and their class. Based on the lister plugin interface of the MAT-file Viewer plugin a simple stand-alone MAT-file Viewer utility has been added. It is strongly recommended to read the Readme for installation details and MATLAB dependencies.